Divya Jyoti Jagrati Sanshtan participated in a 2 day workshop heading "Sustainable genetic improvement, utilization and conservation of Indigenous live-stock breeds: Conventional & Biotechnological approach" 6th and 7th Sept. at SGVP Gurukul, Chharodi, Ahmedabad (Gujarat) for co-formulating strategies for the encouragement, propagation and better care using cutting-edge modern scientific technologies in the field of Indigenous cattle breeding in India. Scientists, Policy-makers, bio-technologies discussed and argued on sustainable genetic improvement and conventional bio-technological approaches for developing indigenous live-stock in India. Swami Chinmayanand, Swami Indreshanand, Swami Amaranand ji addressed the convention and the views and experiences of the Sansthan's work in this field was applauded. NEW DELHI: The Centre on Monday announced a nationwide scheme - 'Rashtriya Gokul Mission' - to protect the "indigenous breed" of cows and set aside Rs 150 crore for it during the current financial year. A number of Integrated Indigenous Cattle Centres (Gokul Grams) will be set up under the mission that will also work for improving milk productivity. Since the scheme will be implemented by states, the agriculture ministry has called a meeting of state animal husbandry ministers here on September 16 to work out the modalities. Announcing the scheme, agriculture minister Radha Mohan Singh said, "The Rashtriya Gokul Mission aims to conserve and develop indigenous breeds in a focused and scientific manner." -------------------------------------------------------------------------------------------------------------------------- The project was implemented with objectives of maintenance of Beetal goats in its home tract in pure form, checking further decrease in Beetal population, production of quality and elite breeding stock and improvement of production potential for sustainable utilization at the farmers’ door. An exhibition of Umbalacherry bulls is proposed to be organised in the district in August. A special consultative meeting in this regard between officials of the Department of Animal Husbandry and Umbalacherry cattle breeders was organised by the district administration here on Wednesday. Underlining the need to protect the breed from slow extinction, the farmers wanted the Umbalacherry variety to be declared a national breed. Collector T. Munusamy said the exhibition was mooted by the Chief Minister to encourage cattle breeders to protect the special breed. The exhibition envisages awareness rallies and prizes for well-kept cattle. One first prize of Rs.10,000 for the best bred bull, followed by two second prizes of Rs. 3,000 each, and four third prizes of Rs. 2,000 each. The contest will also include six consolation prizes of Rs.1,000 each. 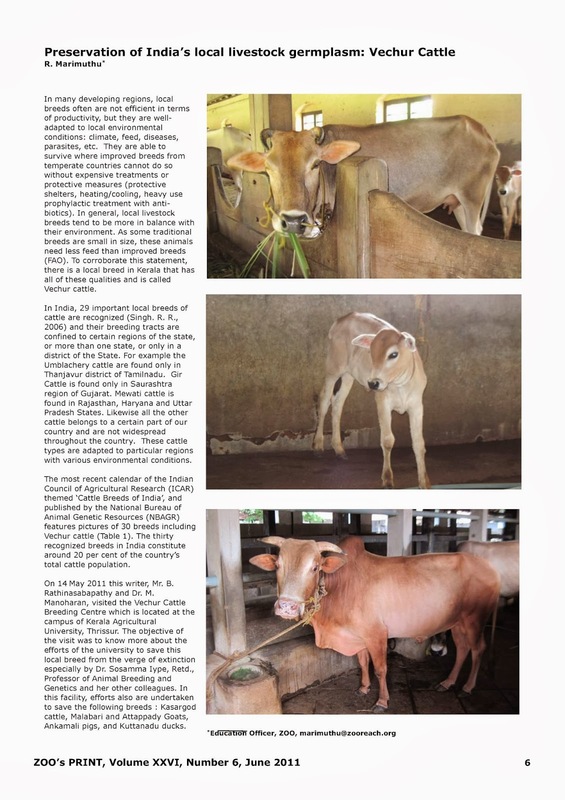 "Vechur cattle – from extinction to sustainability"